If you think you’d like to play the violin, have you ever imagined yourself playing Bach in an orchestra or playing like Boyd Tinsley, a member of the Dave Matthews Band? The violin is undoubtedly “one of the most beautiful-sounding instruments ever invented” and is very appealing to many young people. Of all musical instruments, its sound most closely resembles that of the human voice. It is often called the “queen of instruments.” The violin is in the string family. There are several reason you might consider playing the violin. It comes in different sizes (even a tiny tot can play), it is portable, reasonably priced, and everyone will think you are a hot ticket if you can play. In this book you’ll be able to take a look at a photograph of a violin spread across two pages. Each part is labeled and is accompanied by a description of its parts and their functions. Violinists obviously have a high opinion of the instrument. Martin Goldman claims that “It can help you in anything you decide to do later. Playing the violin builds character. It teaches self-discipline. It shows that you have to work hard for success. That’s a lesson worth learning.” Some young people are interested in playing in groups like Keane, who blend the sound of the violin with other instruments. If you like to mix your classical with your rock, the Vitamin String quartet might be your cup of tea. Along similar lines as the violin, you’ll get to take a look at the “biggest instrument in the string section of an orchestra,” the double bass, the electric violin, the cello and its “velvet-smooth sound” or more unusual instruments such as the South American charango or the Puerto Rican cuatro. In country music, the violin is known as a fiddle. Martie Maguire of the Dixie Chicks started out as a classical violinist. You’ll learn why she ended up in a country band. You’ll also meet Jonathan Russell, a young man who was “the youngest jazz violin player ever invited to take part in a master class at the Lincoln Center for the Performing Arts in New York.” Several people talk about their childhood experiences with this amazing instrument. Do you think you have what it takes to play the violin? Do you feel this instrument is calling out to you? This is an excellent book that will introduce the young student to the amazing possibilities playing a violin can offer them. I enjoyed the casual approach this book had to offer. I liked “meeting” many different types of violin players and listening to what they had to say about their love for the instrument. Some instruments can be easily picked up, but this book appears to stress the fact that it is not an easy one to play and that it will be necessary to work hard and practice if any amount of success is desired. There were numerous photos that added a nice touch to the text. In the back of the book is an index, a list of violinists who contributed to the book, a glossary, and additional recommended book and website resources. Have you checked out David Garrett on YouTube? If you have, I’ll bet you are interested in playing the violin! 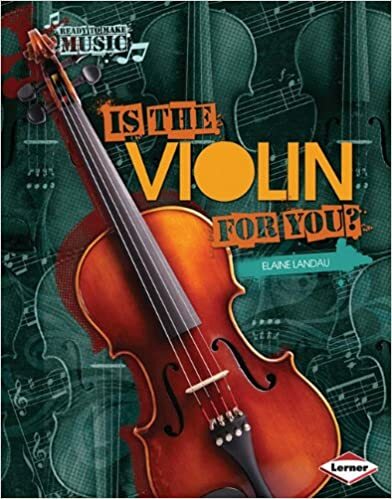 Quill says: If you have a youngster who feels the violin is calling out their name, this is one book you might want to consider adding to your shelves!